Odd that the medieval notion that humans alone, of all life forms on Earth, are capable of emotion persists among the group once known for its willingness to accept the evidence of their senses at the risk of challenging old beliefs: scientists. Without going where the layperson cannot follow, biologist Balcombe bookends the beautiful photographs with well-reasoned arguments for animal sentience. Nature documentaries often depict animal life as a grim struggle for survival, but this visually stunning book opens our eyes to a different, more scientifically up-to-date way of looking at the animal kingdom. 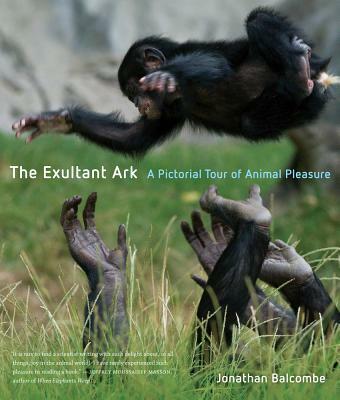 In more than one hundred thirty striking images, The Exultant Ark celebrates the full range of animal experience with dramatic portraits of animal pleasure ranging from the charismatic and familiar to the obscure and bizarre. These photographs, windows onto the inner lives of pleasure seekers, show two polar bears engaged in a bout of wrestling, hoary marmots taking time for a friendly chase, Japanese macaques enjoying a soak in a hot spring, a young bull elk sticking out his tongue to catch snowflakes, and many other rewarding moments. Biologist and best-selling author Jonathan Balcombe is our guide, interpreting the images within the scientific context of what is known about animal behavior. In the end, old attitudes fall away as we gain a heightened sense of animal individuality and of the pleasures that make life worth living for all sentient beings. Jonathan Balcombe is Department Chair for Animal Studies with Humane Society University. His books include Second Nature: The Inner Lives of Animals and Pleasurable Kingdom: Animals and the Nature of Feeling Good. Dr. Balcombe is also a popular environmental conference and keynote speaker.